GRpet.com - Discount Pet Supplies Supports "Wishbones for Pets" Charity Drive- CLICK HERE! GregRobert Discount Pet Supplies http://www.grpet.com/ donates five heated cat beds to Wishbones for Pets Charity Drive. The economy is slowly recovering but not fast enough for cats without homes. Shelters across the United States are overflowing and need supplies to offset budget cuts. GregRobert took the initiative this week to donate warm beds to the Wishbones for Pets Charity Drive which supports local animal shelters. Home Alone Critter Care of Walled Lake Michigan, a representative company for Wishbones, accepted the heated cat beds graciously. The official Wishbones for Pets drive starts in a few weekds- but supplies are needed year round at most shelters. The heated cat beds are especially beneficial for cats with arthritis or other health issues. Many cats are delivered to shelters very hungry or sick. Warm beds are necessary year round to help aid sick cats to recovery. Michelle Miller, director of community relations at GregRobert Pet Supplies stated, "Every little bit that anyone can do to help is a little bit more to the life of an animal without a home. We are fortunate that we could help in these tough economic times." The mission of Wishbones for Pets is to offer a universal community service program hosted by pet sitters that would like to collect and distribute pet goods/funds for local pet shelters and other pet related agencies in their own community. Pet sitters care about their local community, the pet sitting industry and most importantly the animals. The time frame for this event is approximately six weeks prior to Thanksgiving and may extend one week after Thanksgiving with one exception. Contact a pet sitting service in your area to see if they are offering the program or make a donation to the shelter of your choice. GregRobert Discount Pet Supplies was established in 2002 by pet lovers and has grown to a nationally recognized pet supply store with low prices, excellent customer service and fast shipping. Carrying close to 20,000 products they cater to the cost-conscious pet owner. From dog supplies to hamster supplies to horse supplies they have a wide selection of brand name products. Visit GregRobert and take a look at the high quality heated cat beds that they carry. Pet Supply Affiliate Program Review- CLICK HERE! So you are looking for a few extra dollars to supplement your pet-related business and heard about GregRobert's affiliate program.? For those of you that are just "first hearing" about an affiliate program, it's a pretty simple concept that can be summed up by one of the largest affiliate management companies around: ShareASale. A merchant "Shares the sale profits" with the affiliate that referred him or her. Affiliations have been around as long as business has: The local pet store owner suggests a dog trainer in your area when you explain to him that you can't get your puppy to stop nipping, and your groomer suggests a vet that specializes in dog cysts when he finds a small cyst on your dog's body. GregRobert's affiliate program is the same idea. Refer your visitors to thier pet supplies and you will be rewarded with a commission. GregRobert can still offer fantastic prices to customers - so it is a WIN-WIN-WIN proposition. Affiliates registered through the affiliate management program (ShareASale) post links to pet-dog-cat-supply-store.com and/or GRpet.com on their pet related or shopping related websites. The links may be directed towards specific product pages, sections, or the home page depending on the campaign. 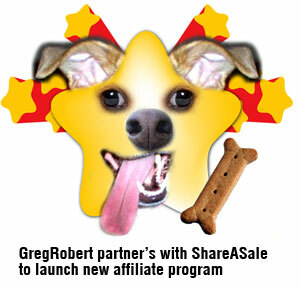 Affiliates earn a minimum of 7% on any revenue generated from customers that they forwarded to GregRobert Pet Supplies. The 7% commission is paid on orders placed within a generous sixty days of clicking the affiliates link to GregRobert. GregRobert's affiliate program has proven itself as a high converter. This can be attributed to a number of things, but we believe the low prices and tremendous reputation aid affiliates in selling effectively. GregRobert is offering something else that many other pet supply affiliate programs do not offer. They are offering a dedicated affiliate manager to support their affiliates that is versed in datafeed management, web design, development and online marketing. So what are you waiting for? Sign up for GregRobert's Pet Supply Affiliate program today and start earning a supplemental income from the products that you WANT to advertise, today. Back to Agility School!- CLICK HERE! Now that the "Back To School" season is officially in full swing, parents, caregivers, babysitters and anyone else who spent the summer romping around with the rugrats can sit back, relax, and finally enjoy some peace and quiet. Yeah,.......right! Considering what it takes to get kids ready for school these days, I believe that the only one who gets the benefit of a quiet house is the family pet. And, sometimes the pet can go through a sad state of mind when the house is empty and there is no one to play with. Let's face it, when we humans crave some peace and quiet, we need it. I know for myself, as much as I love my dog, I have been known to kick him out of my room for some serious solitude time. This could be a great time to help Fido fight the back to school blues by constructing a personalized pet program designed specifically for your pets needs. I have a Samoyed name Harry. Harry's needs are very minimal these days. He is 11 years old now, and he just wants to lay quietly in the shade by the pine trees. However, we do not have a fenced lot, so I do need to keep him on a lead that allows him enough room to roam around and lay down. Other dogs have much more energy and need to be kept busy while kids are not home to entertain. One great way of keeping your dog physically and mentally fit is by setting up its own agility course. The Radio Systems Corporation features the Petsafe line of high quality, easy to assemble dog agility products that can make your dog jump for joy in practically no time. The PetSafe Bar Jump can help teach your dog to jump to new heights with a single bar hurdle. Its simple design and sturdy construction make it durable, but its composition from lightweight PVC ensures that your dog won’t get hurt if he knocks it down. Set-up is easy, and a handy carrying case lets you take the bar with you or store it when it’s not in use. An assembly and training guide are included with the package and any one can use this simple system because it is designed for the beginner training level. Another great product for beginner agility training is the Petsafe Dog Agility 10-foot Open Tunnel. This portable tunnel is extremely lightweight, made of durable ripstop fabric and is very easy to assemble in any open space. You will be able to get your dog to master going through the tunnel straight and then change it up by adding a curve or two for more difficulty. The PetSafe Dog Agility Open Tunnel kit comes with a carrying case so you can bring your tunnel with you, or to store it in a folded position when not in use. This kit also features a training guide with easy to follow directions and pointers on how to get your dog to perform some fun feats. If you are really interested in setting up a super-deluxe, more advanced agility course for Fido, then you can add the Petsafe Agility Weave Poles to your obstacle course. The agility weave poles are one of the most enjoyable parts of an obstacle course for you and your dog. You can have tons of fun by testing your dog's agility and speed with these lightweight, easy to assemble poles. Mastering the agility poles will fill both you and your dog with pride. Each Petsafe agility weave pole kit comes with a total of 6 poles, sent 10 inches apart from one another. This kit includes an assembly guide and an advanced training manual for you and Fido. Whatever course you decide is best for your furry friend, it's sure to beat the back to school blues that your dog may experience while the kids are off learning and you are either enjoying the quiet or going about another busy day. Labels: back to school, dog agility training, Radio Systems corp.
Pet Protection Takes a New Leap- CLICK HERE! DAVIDSON, N.C., Sept. 8, 2009 -- Charlotte-based Pet Grab-n-Go(R), LLC, a company dedicated to products that increase pet safety and protection, announces its first safety product: Pet Grab-n-Go(R). After three years in development, Pet Grab-n-Go(R) (pat. pend) provides an all-in-one storage space for your pet's supplies and can double as a crate cover in your home. Now pets of all kinds no longer need be separated from their belongings and their identity. Of the estimated 50,000 pets left behind in the aftermath of Hurricane Katrina, approximately 13,000 were rescued and only 20 percent, or about 2,500, of those pets were reunited with their owners. Michael A. Williams, Director of Sales, says, "June 1st marked the official start of hurricane season, so now is a good time to actively prepare for your pets. The same measures of preparedness are also important when applied to home accidents or other natural disasters, such as floods, tornados, wildfires and severe storms." Only 21 states have enacted pet evacuation plans per The Pets Evacuation and Transportation Standards Act of 2006. "That means pet owners must take responsibility for their pet's safety," advises Williams. Today, this is possible with a safe, convenient and easy Pet Grab-n-Go(R). First, use the handy supply list provided in a Pet Grab-n-Go(R) to create a list of pet necessities. Don't wait. Collect your supplies now. Pets cannot prepare for themselves. Second, owners should keep all pet necessities in one location for quick retrieval. "This is vital for their safety," says Carolyn B. Matlack, Inventor. Pet Grab-n-Go(R) makes it easy by providing all-in-one storage for your pet's picture and I.D., vet records, toys, first aid kit, food, bowls, medicine, leashes, kitty litter and much more. Third, contact hotels and motels and keep a list of pet-friendly places, including phone numbers. Ask friends, relatives or boarding facilities and veterinarians if they can provide shelter and include 24-hour phone numbers on your list. Local shelters may already be overwhelmed, so they should be used only as a last resort. Pet Grab-n-Go(R), LLC was born of the inventor's lifelong love for animals. "Following the horrific scenes of Hurricane Katrina, my passion developed into a personal vow to increase the survival rate of our beloved animal family members during a disaster," says Matlack, who is a lawyer/author of "We've Got Feelings Too," a book offering a solution about improving our legal treatment of animals. "Our mission," Matlack continues, "is to offer pet owners peace of mind by providing safety and convenience for their pets at home, while traveling and during emergencies." When not on the go, use your Pet Grab-n-Go(R) as a decorative crate cover in your home, or hang it in a closet as a shoulder bag. No matter how you use it, a Pet Grab-n-Go(R) keeps you ready to grab and go! For more information, visit http://www.petgrab-n-go.com or email info@petgrab-n-go.com. Stop Your Cat from Scratching on Your Furniture- CLICK HERE! All cats have the natural instinct to scratch their nails and this habit can be very frustrating for a variety of cat owners. If your cat has the tendency to scratch on your furniture or your wood trim in your house, it is a good idea to set-up scratching stations around your house to keep your cat from distroying your house. A scratching station can consist of any type of scratching post or pad that your cat likes. Keep the scratching station infused with catnip everyday to encourage good scratching behavior. One of my favorite scratching posts is the Super Catnip Cat Scratcher House. This fun little house is designed to attract your cat and keep your cat entertained for hours. It is easy to put together and once it is assembled, your cat won't be able to resist going inside and scratching the fun floor pads. You can also sprinkle some catnip on the floor pads to make your cat's interest last longer. It is great for a cat of any age and even gives cats privacy when scratching. Another favorite scratching post of mine is the Carpeted Scratch Post by Doskocil. Any cat who loves to scratch the carpet or furniture will love to sink his claws into this soft post. 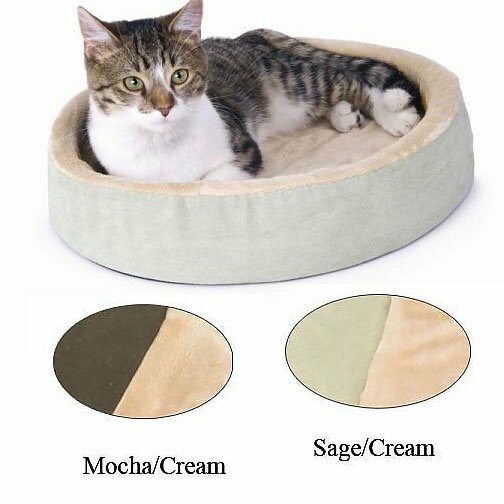 It is made with plush carpet and very attractive to cats. The post looks attractive and can be placed any where in your home. It also keeps your cat scratching longer when you sprinkle some catnip on top. If your cat likes to claw up your door frames, you may also want to consider hanging a cat scratcher on a door knob to get him interested in something else. A fun and entertaining door knob scratcher for your cat is the Play-N-Squeak Scratch It Cat Scratcher. Your cat will be attracted to the mouse sounds this scratcher makes and will have fun scratching the surface of the scratcher pad. At first, you may want to offer your cat a variety of surfaces to scratch on in order to find the surface that your cat likes the best. It is a good idea to place your scratchers in several areas of your house to create a good scratching habit. You can place the scratchers near the areas that your cat is currently scratching and gradually move them away from those areas when he becomes accustomed to scratching on the post or pad.